There are Mom Certificates absolutely free, no strings attached, for your special mom on Mothers Day below that will help your mom enjoy her special day and make it even more special. 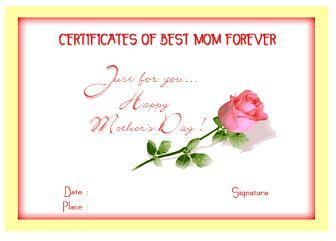 There are many ways to show your mom that you love her and these certificates will help go a long way with mom. Mothers Day Ideas such as these beautiful certificates are at no cost, except for the paper and ink, and can make your mom feel very special. You do not have to have a lot of money to please mom on Mothers Day. Mothers Day is one of the biggest dates on the church calendar. Christians have always went beyond the call of duty to take special pains to honor the women and moms on Mothers Day. It is always anticipated that there would be a huge increase in attendance on that particular Sunday service or whatever day your main weekly service falls on around Mothers Day. Our Pastor at our church preaches a special sermon on mothers, and then after the sermon our Pastor's wife has gifts to present to our moms, and special gifts for the oldest mom, youngest mom, mom with the most children, etc. She also has each mom put their name by a number when they come up to get their Mothers Day gift and then she gives a special gift certificate to a nice restaurant for two to the person whose number is drawn. Return to Mothers Day Ideas from More Mom Certificates.